Herrick (second from left) and others named as 2018 Invader Crusaders. 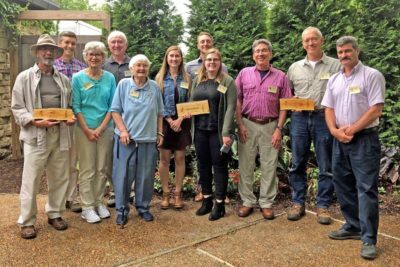 The Wisconsin Invasive Species Council has recognized Arboretum ecologist Brad Herrick as a 2018 Invader Crusader. The awards are presented to individuals and groups for outstanding efforts in addressing issues of invasive species in Wisconsin. Since the Asian jumping worm (Amynthas spp.) was discovered at the Arboretum in fall of 2013, Herrick has spearheaded efforts to learn more about the worm, map its presence here, learn about biology and behavior, and research ecological impacts and potential controls. He has collaborated extensively with UW–Madison scientists and students as well as state and community partners, and “has a reputation as insightful, fun to work with, and motivated to find solutions. He’s an innovative thinker and definitely a mover-and-shaker for everything from invasive plants to soil invertebrates” (from the awards program). We couldn’t agree more. Congratulations, Brad!